What makes someone an expert? Does it take a title, authority, or skill? At LMK we believe an expert, above all, is someone with the heart of a teacher—someone who doesn’t just possess advanced knowledge but is also willing to share that knowledge for the benefit of all. LMK’s commitment to both expertise and education is what inspired our most popular and most important service offering: TMF University. TMF University is our industry-first TMF training program, providing a wide range of courses to suit all needs—from beginners just learning to identify common regulatory documents to professionals seeking to hone their expertise. TMF University is competency focused and designed for real world implementation. All TMF University courses are structured to build essential skills, quickly translating into a healthy TMF and a happy clinical team. Celebrating TMF University’s renewed focus on taking TMF action, LMK is proud to present this how-to blog post, part of a multi-week how-to series. In the coming weeks we’ll dispense theory and focus on mastery of the basic TMF skills we think every clinical research professional should possess. What: What is the TMF Reference Model? The TMF Reference Model is an industry-adopted reference structure for the TMF that takes the form of an index. Think of the TMF Reference Model like the taxonomy that biologists use to classify all the various types of life on Earth or the Dewey Decimal System that helps keep books organized in a library. Instead of helping organize beetles or paperbacks in a useful and consistent way, the TMF Reference Model helps clinical researchers standardize and organize the documents in their TMF. The TMF Reference Model isn’t required to be used by any authority—rather it’s a helpful free tool that the pharmaceutical industry has embraced. It’s important to fully understand that the TMF Reference Model is not the product of regulation, but rather the result of an ongoing project of a community associated with the DIA, the Drug Information Association. DIA is a more than fifty-year-old global industry association of companies and individuals who contribute to healthcare product development and management. The TMF Reference Model is only ‘associated’ with the DIA because the TMF Reference Model isn’t owned by anyone. The production of the TMF Reference Model (and its continual updates) function a lot like Wikipedia, where individuals with knowledge have come together to fill a need within the industry for TMF standards. How: How do you use the TMF Reference Model? 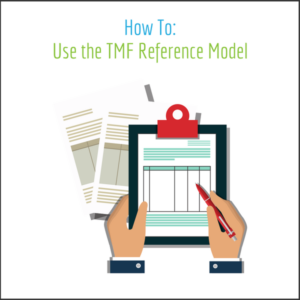 The TMF Reference Model is presented here within an Excel spreadsheet (we encourage you to open the link to download the spreadsheet and follow along). First opening the TMF Reference Model can be overwhelming because of the sheer amount of information within the spreadsheet. Those unfamiliar with the TMF Reference Model should navigate to the first tab titled v3.0. This tab is the ‘home page’ of the TMF Reference Model and contains the full document taxonomy. As you become more familiar with using the TMF Reference Model, you’ll find that you use this tab most of the time. Focus on columns A-I. The TMF Reference Model attempts to sort every relevant document into a pre-defined location. Think of the act of filing a document like a vintage gravity coin sorter (one of those plinko-like contraptions that sorts quarters, nickels, pennies, and dimes into rolls for the bank). The incoming document is first compared against a limited number of high-level ‘Zones’ that account for coarse distinctions between certain documents: Did the document come from data management? Does the document relate to an Ethics Committee? Is it related to the investigational product handling? Let’s say the document we want to file is an IRB approval – so it belongs in Zone 04 (IRB and other Approvals). Within each Zone, there are Sections, Artifacts, and Sub-Artifacts. Sections provide greater granularity within a Zone: Is the IRB document, referenced above, related to a submission or an approval? Is it just an email about the IRB? An artifact represents a type of document, like ‘meeting materials’ or ‘safety notifications.’ Finally, within each artifact are variants of that artifact (with some having more variants than others): Is the IRB approval conditional or full? Is this document only an acknowledgement of receipt? As your document moves from the least specific Zones to the most specific Artifacts, ultimately finding a filing location, it will accumulate the numbers listed in columns A, C, and E. Our example document, an IRB approval, will be filed in 04.01.02, IRB or IEC Approval. Once you are familiar with the basic structure, you can begin to move right on the spreadsheet, reading about the purpose of each document in column H, or considering more advanced concepts like what TMF Level a document belongs on (we’ll discuss that in a later blog) or what date convention is recommended for the document. Yes, the TMF Reference Model is a sophisticated tool, but the basics aren’t any more complicated than putting a book back on the correct shelf in a library. Why: Why is the TMF Reference Model important? Although the answer to the question above could fill a whole library, to simply appreciate why the TMF Reference Model is important, one needs only consider what it was like before the TMF Reference Model was used. Every company had a different TMF structure and different names for their documents. The list of essential documents required by name in ICH GCP Section 8 is only a small portion of what is required for an inspection ready TMF, therefore knowing what regulators expected in the files was a moving target. When TMF stakeholders changed companies (or even studies), they usually had to learn a new TMF from scratch. When TMFs changed hands with mergers and acquisitions, chaos ensued. By ensuring that TMF documents can easily be compared, moved, and grouped based on common attributes, many of these problems are solved or minimized. Although the TMF Reference Model is not a one-size-fits-all solution, it’s hard to imagine sustaining a large, modern eTMF without it.